* A Guest Artist provides service to SJSU at a non-hospitality related event, e.g., an activity associated to academics or instruction. Student Union/Event Center room and audio visual rentals and/or charges. Guest Speaker and Guest Artist services are allowed through the Direct Payment process when no agreement/contract is required and payment does not exceed $1,000; otherwise a Requisition is required. 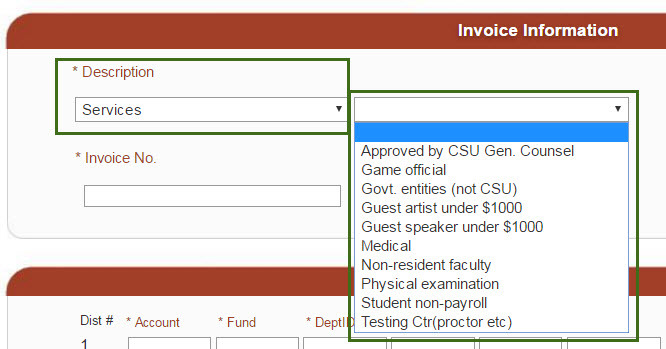 In FTS, the Direct Payment Voucher “Description” dropdown list has been revised to include Fees and Services, which when selected, an additional dropdown list will appear. 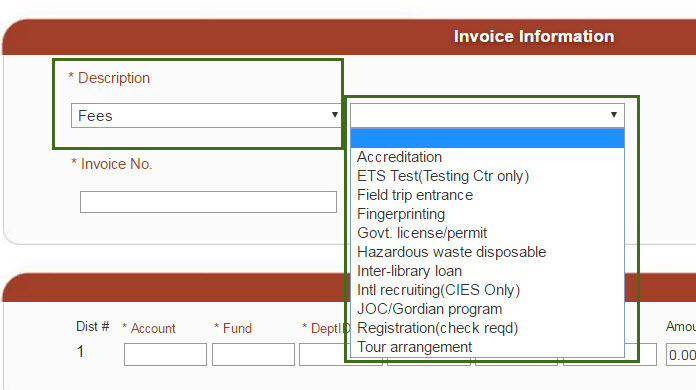 All of the allowable fee and service types are now available to select. Products and services not specified as allowed via Direct Payment can be requested using other Procurement Pathways. Visit Procurement Pathways for complete guidelines. Please contact Finance Support if you have any questions at financeconnect@sjsu.edu or 4-1558. The Direct Payment Checklist has been renamed Direct Payment Products and Services. Please refer to Direct Payment Products and Services for products/services allowed for purchase through this process. Services are now specifically identified as guest speaker, game official, medical and physical services, proctor, and student non-payroll. Graphic design, photographer, and illustrator have been removed from the list. Accreditation is now called Accreditation Fees. Refunds to Non-Student/Employee has been added. Subscriptions are allowed unless they are online or software. Products or services not specified as allowed via Direct Payment, can be requested using other Procurement Pathways such as a Requisition or ProCard. Visit Procurement Pathways for complete guidelines.